Villa Uma has an extensive lawned garden and spacious interiors making it ideal for large groups. It's located less than 10 minutes' drive from the chic marina of Vilamoura and the beautiful Falesia Beach. You'll find plenty of restaurants, shops and even a casino around the marina, as well as several golf courses and sports facilities in the area to keep you occupied. Pool heating, WiFi and air conditioning/heating in the bedrooms are included in this 5 bedroom villa. The extensive lawned garden, roomy interiors and location in the desirable resort of Vilamoura with the marina within 10 minutes' drive. Outside, extensive lawns on either side of the villa offer plenty of space for children to play, and the garden is fully enclosed and bordered by hedging, flowers and tall pines. The large, south-facing pool terrace offers ample opportunity to relax with a cool drink before a much-needed dip in the pool! There is a table and chairs on the covered terrace, complemented by the brick BBQ - perfect for alfresco dining. Double entrance gates open onto a large forecourt with parking space for 3 cars. The front door opens into the living area. The open plan living space has a comfortable seating area one end and a dining table and chairs to the other for entertaining your party. Patio doors allow plenty of natural light in, as well as open onto the pool terrace and garden. The large, fully equipped kitchen and utility room are adjacent. On one side of the lounge there is a double bedroom with en suite bathroom and a twin bedroom with en suite shower room. On the other side is a corridor with 2 twin bedrooms sharing a separate shower room. These 2 twin bedrooms and the double bedroom all have patio doors opening onto the terrace, both with access onto the terrace. The second double bedroom commands the first floor with a dressing area, en suite bathroom and patio doors onto a balcony overlooking the garden towards Vilamoura and the sea. This villa has applied for a licence and the submission number is AL 275/09. The licence number will follow. This villa has an enviable position on the outskirts of the chic resort of Vilamoura. The resorts international marina and the beautiful Falesia Beach are both within 10 minutes' drive. It's ideal for anyone wanting a relaxing base a short distance from a choice of shops, restaurants, attractions and leisure activities. The exclusive resorts of Vale do Lobo and Quinta do Lago are also within easy each by car. There is a supermarket around 10 minutes' drive away. The resort of Vilamoura, 4 miles away, is centred around its famous marina, which has chic shops to suit all tastes. Alternatively, the town of Quarteira has a busy Gypsy market on a Wednesday - a popular attraction for locals and tourists alike. Or why not head 20 minutes north to the traditional resort of Loulé with its colourful Saturday morning market? Nearby Vilamoura Marina has a vast choice of restaurants and bars to suit all tastes, as well as a casino and choice of nightlife. There is something for everyone! The closest beach is the magnificent Falesia, less than 10 minutes' drive away, which runs for several miles westwards along the coast. There's also Quarteira with its popular beach and Fisherman's harbour. There is a choice of waterparks and a go-karting track all within a short drive with tennis courts, horse riding facilities, water sports and sea fishing also nearby. Zoomarine Oceanarium and dolphin show also makes a great day out, within 25 minutes' drive. About 20 minutes west of Vilamoura is Albufeira, the Algarve's largest resort, with an abundance of shops, cafes and restaurants in its pretty, cobbled pedestrianised old town, a colourful marina and a thriving nightlife. Faro is 30 minutes away by car and is well worth visiting for its historic old town by the attractive marina. 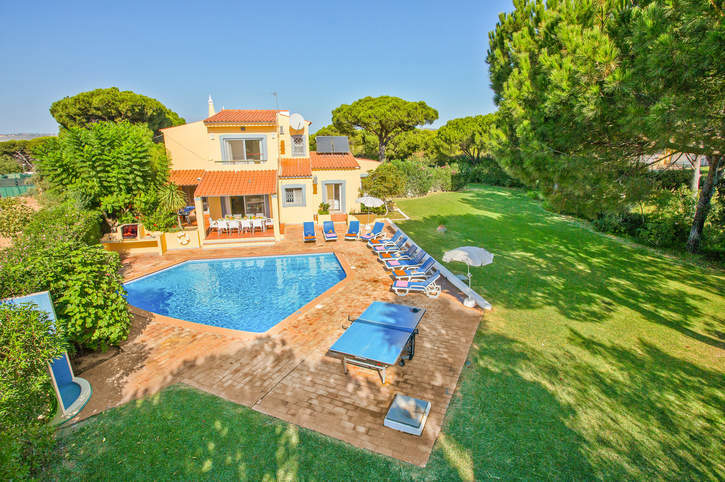 For golfers, Villa Uma is perfectly located with a huge choice of courses in the local area, with 6 in Vilamoura alone! Brown's Sport and Leisure Centre is within a few minutes' drive offering a range of activities including tennis and squash facilities, a gym, sauna, bar and restaurant. Parque Aventura is to the west of Vilamoura in Santa Eulalia, Albufeira, comprising of a paintball centre and various adventure courses through the trees made up of zip wires, bridges and ropes. Villa Uma is not available to book for season as it is sold out. Take a look here at the Algarve villas that are currently on sale. Browns Sports and Leisure Club in Vilamoura offers a good combination of indoor and outdoor sport and leisure facilities including tennis, basketball, hockey, an outdoor and indoor swimming pool, a gymnasium, exercise studio and a children’s activity programme. The club’s Bar & Grill offers lunch and evening menus. Tel: 289 321 170. The first of four golf courses at Vilamoura, Portugal's largest private leisure resort. The resort hosts four more golf courses, a modern casino, a marina and an air strip. Vila Sol became famous in 1992 when it hosted the Portuguese Open within a year of its opening. Wind-surfing board hire and water skiing (instruction if required) are available during the summer months. Tennis fans have a good choice of clubs and courts at local holiday villages and hotels. Vilamoura Tennis has 12 courts (Tel 289 314169), Aldeia do Mar has two courts (Tel 289 302635), Aldeia do Golf has two courts (Tel 289 302844), and Hotel Dom Pedro Golf has six courts (Tel 289 389650). Tennis is also available at Balaia Village, Albufeira (Tel 289 501273). Met and surpassed all expectations - superb location, quiet, and very homely.